Salmon is the third most frequently consumed seafood product in the U.S. and is surpassed only by shrimp and canned tuna. Grilled, or any way you prepare it, salmon is a nutritional powerhouse that provides many impressive health benefits with its low-fat, high quality protein. Packed with vitamins, omega-3 fatty acids and vital nutrients, salmon may help to lower your blood pressure and possibly reduce the risk of a heart attack or stroke. All species of salmon are born in freshwater rivers and migrate to the ocean to mature. They then return to the streams and rivers where they were born to spawn and die. Six types of salmon, all with different characteristics, are consumed in the U.S. and include Atlantic, chinook, chum, coho, pink and sockeye salmon. Atlantic salmon are commonly farm-raised because commercial fishing has depleted much of the wild ­population. Farm raised Atlantic salmon account for 2/3 of all salmon eaten in the U.S.
Chinook, or king salmon, is the giant among the salmon family and can weigh more than 100 pounds. It has a fattier meat than pink or chum salmon. Coho, or silver salmon, is a fighting game fish and grows to 30 pounds. Coho meat is red with a rich taste. Sockeye salmon are the smallest salmon, identified by brilliantly colored firm red flesh. The taste and quality of sockeye salmon is similar to coho. Chum salmon are often overlooked as a candidate for the dinner table because of their sheer ugliness, especially during their spawning period. Their meat tends to be drier than that of chinook or coho. Pink salmon are small fish, averaging just several pounds. They are not a particularly tasty fish but are used primarily for canning. The nutritional value of salmon tends to be the same. Since Atlantic farmed salmon is the most commonly consumed type of salmon, it will be used for the basis of this nutritional analysis. A serving is 3 ounces, or 85 grams, which is about the size of the palm of your hand. Cooked with dry heat (grilled) the number of salmon calories is low, with only 175 per serving. There are no carbs in salmon nor any dietary fiber. A fatty fish, salmon contains 54 milligrams of cholesterol, representing 18 percent of the daily value per serving. With 11 grams of total fat, a serving of salmon supplies 17 percent of your daily value. Of the total fat content, 2 grams, or 10 percent DV, is saturated fat. Dietary Guidelines recommend limiting your intake of saturated fats to less than 10 percent of your daily caloric intake. Their suggestion for the amount of dietary cholesterol you should eat is about 100 to 300 milligrams across the various calorie levels. Your body needs protein for every metabolic function from maintaining your muscles and nervous system to keeping your skin, hair and nails healthy. All types of salmon provide high-quality protein, containing all the essential amino acids your body cannot make on its own. A 3-ounce serving of cooked Atlantic salmon contains 19 grams of protein. This amount of protein is similar to coho and all other varieties of wild-caught fish. Dietary Guidelines recommend a daily intake of 46 grams of protein for women and 56 gram for men. Studies have shown that a high-protein diet can help you with weight control by regulating the hormones that control appetite and make you feel full. If you are satiated, it is less likely you will succumb to snacking and overeating. For example, a 2014 study, published in Nutrition and Metabolism, suggested that fish was a healthier alternative to high-fat animal protein for the benefits of weight loss and less likely to have the potential of increased acid load on the kidneys. Another study found that increased protein led to an improvement in body weight maintenance over a six month period. Conclusions reported in the Journal of Nutrition suggest that inadequate protein in the diet contributes to regaining weight after weight-loss. Read more: How Much Protein Is Right For You? Grilled salmon is especially rich in B vitamins, which work together to maintain the proper functioning of your brain and nervous system. The B group of vitamins are also needed for energy production, controlling inflammation and protecting your heart. Riboflavin (vitamin B2) assists in the production of energy and cellular function. A 3-ounce serving of salmon contains 7 percent DV for riboflavin based on a 2,000 calorie per day diet. A superb source of niacin (vitamin B3), grilled salmon provides 43 percent DV with 6.8 milligrams per 3-ounce serving. You need niacin for your cells to communicate. With 13 percent DV for pantothenic acid (vitamin B5), eating a serving of salmon may help your liver cope with toxins and help generate energy for your body. Vitamin B6 is important for your immune system and assists in the production of hemoglobin, which is essential for transporting oxygen throughout your body. Grilled salmon provides 28 percent DV per 3 ounces. 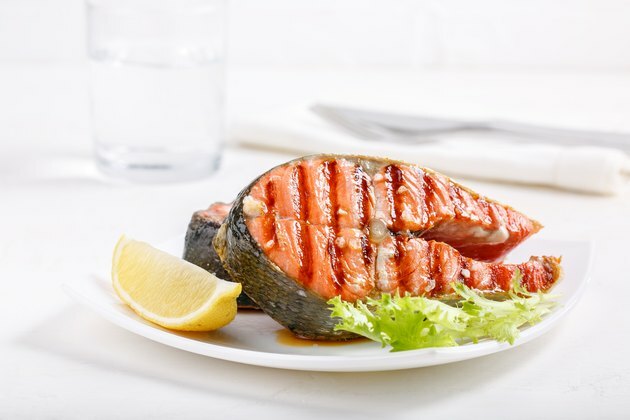 A piece of grilled salmon is particularly valuable for supplying your body with vitamin B12 to keep your blood cells and nervous system healthy. Salmon contributes 40 percent of your daily requirement per serving. If you don't get outside to soak up some sun as often as you need to, eating salmon can restore your vitamin D levels by providing most of your daily requirements in just one serving. Salmon offers 447 IU of the 600 IU daily amount recommended by Dietary Guidelines. Vitamin D helps your body absorb calcium and promotes bone growth. A serving of grilled salmon also offers some other vitamins, including the antioxidants vitamin A (4 percent DV), vitamin C (5 percent DV) and vitamin E (3 percent DV). Atlantic salmon is an important source of phosphorus and offers 21 percent DV with 214 milligrams per serving. Phosphorus supplies many health benefits including protein formation and bone health. All fish, especially salmon, are an excellent source of selenium. This important trace mineral acts as an antioxidant that not only helps protect your body against free radicals that cause chronic disease, but is necessary for normal bone metabolism. A 3-ounce serving of Atlantic salmon contains 35 micrograms of selenium, which provides 50 percent of your daily value. Other minerals in salmon include potassium, which helps to control your blood pressure and reduce the risk of stroke; magnesium, to improve your bone density and lower your risk of osteoporosis; calcium, which may protect you against diabetes and cancer; and 2 percent daily value for each of the trace minerals zinc, copper and iron. Eating the EPA suggested two to three servings of fish per week will provide another nutritional benefit of salmon: healthy essential polyunsaturated omega-3 fatty acid, which is important for the health of your heart, brain, inflammatory, nervous and immune system. A 3-ounce portion of farmed salmon has 1.9 grams of long-chain omega-3 fatty acids, while the same portion of wild salmon contains 2.2 grams. National Institutes of Health recommends a daily intake of 1.1 grams of omega-3 for adult women and 1.6 grams for adult men. The anti-inflammatory effects of omega-3 has been credited in reducing symptoms of metabolic syndrome (MetS), which are markers for conditions leading to chronic disease. The results of a study published in PLoS One in 2015, suggests that the omega-3 fats in salmon and other fatty fish may decrease belly fat and waist circumference in overweight individuals. Nutrients: Selenium in Bone Health: Roles in Antioxidant Protection and Cell Proliferation. Stroke: Potassium Intake and Risk of Stroke in Women With Hypertension and Nonhypertension in the Women's Health Initiative. Medical News Today: Why Do We Need Magnesium? Are Frozen Salmon Fillets Healthy?